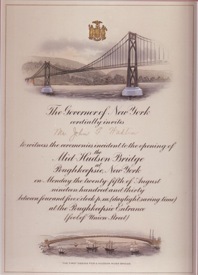 With its gold-embossed New York State seal, engravings of the first proposed Hudson River crossing and the one constructed, the hand-colored invitation shown below, reads: “The Governor of New York Cordially invites Mr. John F. Wadlin to witness the ceremonies incident to the opening of the Mid Hudson Bridge at Poughkeepsie, New York on Monday the twenty-fifth of August nineteen hundred and thirty between four and five o‘clock p.m. (daylight saving time) at the Poughkeepsie Entrance (foot of Union Street)” John F. Wadlin was the then supervisor of the Town of Lloyd, and was one of Ulster County’s representatives at the historic opening. The Mid Hudson was the first Hudson River vehicle crossing to be built north of the Bear Mountain Bridge which was constructed in 1924. 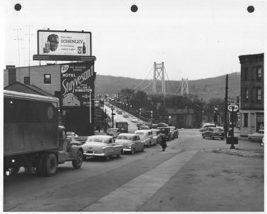 Initially, Mid Hudson’s toll booths were located at the Poughkeepsie side of the span. The first full year of its operation for which figures are reported by the New York State Bridge Authority (NYSBA), 1933, saw just under 394,800 vehicles transverse its deck. By 1943 it was 976,000. The year 1953 saw 3,887,000. By 1963 it carried 4,640,000. The next two decades saw the number climb to nine million. Between 1993 and 2003 it climbed to 13,700,000 vehicles. The last year of detail was 2013 when 13,767,000. The only non spectacular increase was from 2003 to 2013 where traffic grew only about 750,000 vehicles. The bridge today carries about 58,000 vehicles daily between Highland and Poughkeepsie. Poughkeepsie entrance to Mid Hudson Bridge. An automobile today is charged $1.25 for a two-way trip using E-Zpass, or $1.50 paying cash. When the bridge opened eighty-four years ago, the toll was 80 cents for cars, and ten cents for pedestrians. There was a also charge for vehicle passengers, whether they were people or pigs. That was very expensive in the 1930s. At the time, the Mid Hudson Bridge still had competition. One source was from the Brinckerhoff ferry, another in winter from the “no-toll” solidly-frozen Hudson used by vehicles and pedestrians. Much of the cross-river commercial shipping could be accomplished via the Poughkeepsie Highland Railroad bridge which had opened in 1888. 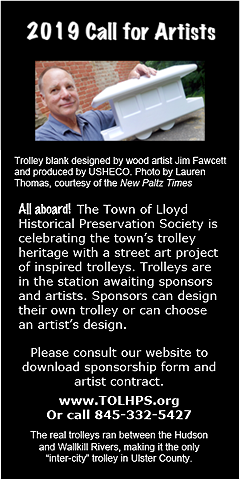 That same rail bridge carried a small trolley that brought passengers from Poughkeepsie to Pratts Mills on the west side, where a second trolley originating at the Hudson River in Highland, would pick up and take the travelers as far as the west side of the New Paltz Village at the Wallkill River, or down to the west shore to catch the passenger train or a day-boat. Trucking was not as important as it is today, but still only 16% of today’s revenue is from commercial traffic. Whether the early competition kept the price of a trip lower in the early years is hard to discern. The Ferry Brinckerhoff’s days ended in 1941. The New York State Bridge Authority took responsibility for the Mid Hudson Bridge on March 17, 1933. Accommodating today’s staggering traffic has taken creativity on the part of the authority. From one-way toll collecting, to three lanes of traffic during rush hours, to major changes such as restructuring the east and west side approachs (making the latter a more gradual turn), traffic flow is much smoother and congestion minimized. 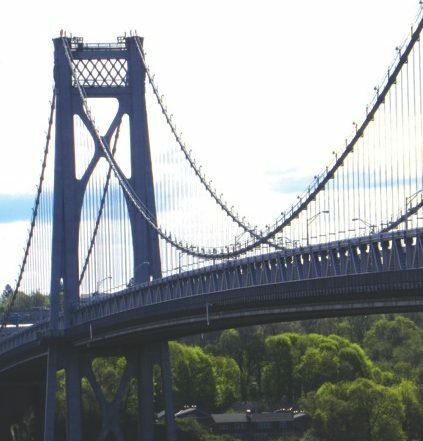 The Mid Hudson Bridge was designed and built by Modjeski and Moran, the same Ralph Modjeski who had worked on the Poughkeepsie Highland railroad bridge 45 years earlier. (A fire on May 8, 1974 took that bridge out of service and it eventually became the popular Walkway Over The Hudson). 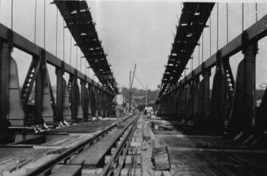 Modjeski’s and his company’s achievements are well documented, having received multiple Engineering Awards and vast publicity for both bridges. The neighboring bridges’ above-water designs are completely different and reflect the differing uses intended and the different centuries of their construction. When Modjeski was building the cantilevered railroad bridge (1880s), suspension bridge construction was reaching its pinnacle with the spectacular Roebling-designed and built Brooklyn Bridge (1888). 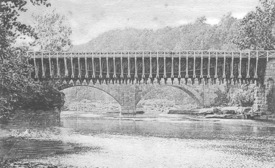 (Locally, Roebling designed and constructed the long-gone suspension aqueduct in High Falls which replaced a cement arched aqueduct that took traffic of the D&H canal over the Rondout Creek). High Falls aqueducts at Rondout Creek. Roebling’s suspension in front of arches. The Mid Hudson’s two hundred thousand pound caissons were set into the river and weighted down, sinking them until they found purchase on solid rock. For a detailed explanation of how the underwater pilings and cassinos were built, see David McCullough’s book, The Great Bridge, on the building of the Brooklyn Bridge. The process used was similar for the Mid Hudson—dangerous and difficult. 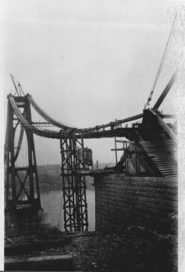 This underwater work began for the Mid Hudson Bridge in April 1925. Work on the superstructure started just a few months before the 1929 October Black Friday Wall Street Crash. However, that apparently did not hold up the further construction of the towers and cabling. The bundle of cables suspending the Mid Hudson are massive and anchored into bedrock at each end. A mere one year and four months later on opening day, 12,000 vehicles and 30,000 pedestrians crossed its 3000 feet of roadbed 180 feet above the river. River to bridge clearance is 135 feet, (not tall enough for America’s Cup yachts, by the way). The roadbed section between the towers is 1500 feet long. The bridge’s roadbed is 30 feet wide, and two four-foot wide sidewalks. The steel towers are each 315 feet high. It is hard to imagine the joy and sense of “anything is possible” that those crossing must have felt on opening day. A huge majority of people taking part had to have at least watched the construction of, if not actually worked on, the bridge. That day’s celebration focused on dignitaries whose accomplishments could not compare to the most humble laborer’s contribution to the bridge’s existence. To open the bridge Governor Franklyn Roosevelt’s wife, Eleanor, cut the ribbon on the east side. On the west, the wife of former Governor, Al Smith did the honors. If Mr. Modjeski is turning over in his grave today, it is to have a better view and marvel at the traffic his bridges see: Walkway had more than 690,000 visitors in 2013; the Mid Hudson accommodated 577,596,836 vehicles. Or, perhaps he cranes his neck to see the 16.1 million colors of lights gracing the cables provided by an energy efficient LED system designed by Baker Engineering and installed in 2001. From Independence Day’s red, white, and blue, to Christmas’ red and green, and other significant dates in between, the bridge lighting reminds us of our heritage and brightens our crossings. Or, maybe Mr. Modjeski stirs to listen to Joseph Bertolucci’s “Bridge Music” composed using the percussive sounds of wood and metal gently striking the railings, girders, beams, and cables of the bridge. You, too, can listen. Use your radio dial at both ends of the bridge and tune into FM 95.3 or go to one of the listening stations on each of the bridge towers, April 1 through October 31. For those of us who remember the old western approach to the bridge on Haviland Road in Highland with its sudden left turn to enter the bridge, or the often endless wait during rush hours, or the names of toll-takers at the east end of the bridge, and that the toll-takers took tolls in two directions, much has changed for the better. In the NYSBA’s 1982 Annual Report, they estimated the replacement cost of the Mid Hudson Bridge at $109,278,000. But for those of us who have admired the mighty span for decades, we know it is priceless. 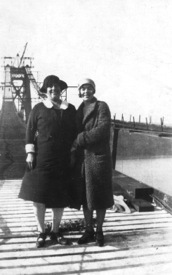 The first women to cross the bridge were Highlanders Mrs. Peter M. Thompson and Mrs Edward Borquist. Mrs. Thompson’s husband was a boss bridgeman and secured permission for the walk. They described the walk on the catwalk as “full of thrills” as there was a strong wind. Note width of catwalk and “safety” cable on right side of photo behind the women. Much appreciation to the NYSBA office in Highland, especially to Olive Cadet, Administrative Assistant, NYSBA Engineering Department, and to and William J. Moreau, PE, Chief Engineer for their help acquiring images and providing information. Other information for this article is from nycroads.com/crossings/mid-hudson. Photos by Vivian Yess Wadlin, or from her collection, unless otherwise noted.